We are a two site small animal practice in South Lakes, first established in the early 20th century. We are passionate about animal care and our skilled team of veterinarians and vet nurses are dedicated to providing the highest quality care for your animals. Because we love animals and strive to provide excellent continuity of care, we are open six days a week and have access to 24-hour emergency care. Here at Church Walk Veterinary Centre we are delighted to be taking part in hypertension awareness month. 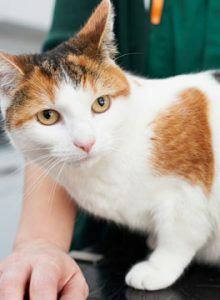 Hypertension, otherwise known as high blood pressure, is a common problem seen in our feline friends. As one in eight senior cats are affected by hypertension we recommend that cats over the age of seven should have their blood pressure measured annually. To celebrate hypertension awareness month we are offering free blood pressure checks throughout September to all cats over this age. To find out further details, or to book your cat in for a free blood pressure check, please contact Barrow-in-Furness on 01229 829863 or Ulverston on 01229 583675. Church Walk Veterinary Centre is part of CVS (UK) Limited, a company which owns over 490 veterinary practices within the UK. Company Registration Number 03777473 – Registered Office: CVS House, Owen Road, Diss, Norfolk IP22 4ER.